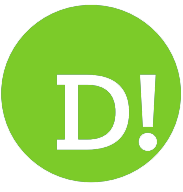 By David Whinyates on 2018-06-07 - David is one of the UK’s most experienced motoring writers and was instrumental in setting up the Driving Force syndication service for Britain’s biggest regional newspaper group. 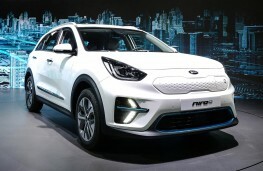 Former Chief Motoring Editor of Trinity Mirror Regionals, he is Driving Force’s Consultant Motoring Editor and a director of Driving Force Media Ltd.
ANY lingering doubts drivers may have about the everyday practicality of electric cars should be firmly dispelled when the new all-electric version of the Kia Niro arrives in the UK. For it will have a single-charge range of almost 280 miles - enough to get you from London to Leeds, with zero emissions and juice to spare, before you have to hook up to the mains. 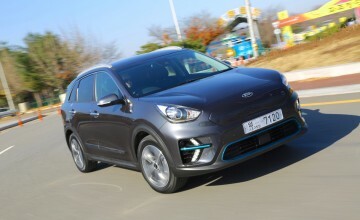 And even then it will take a mere 54 minutes to recharge the Niro EV's battery to 80 per cent. through a 100 kW fast charger. 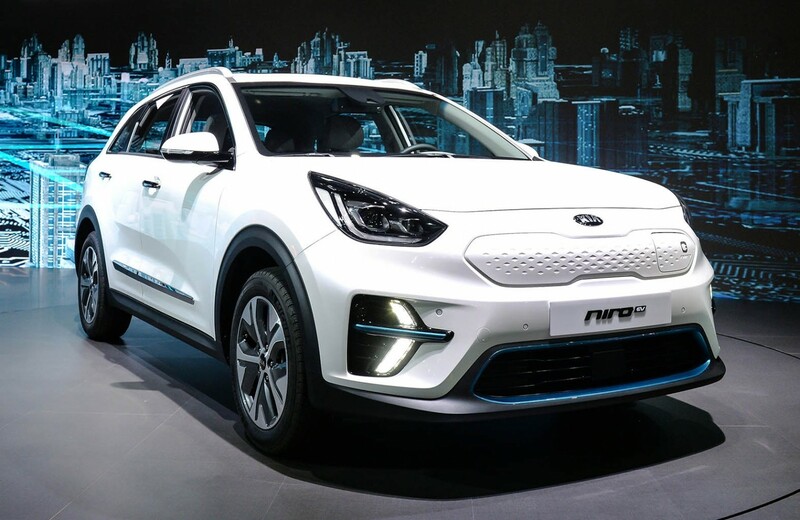 Unveiled at the Busan International Motor Show in Korea, the Niro EV will go on sale in its home country later this year with UK and European sales following at an as-yet unspecified date. In Europe, the Niro EV will be equipped with a high-capacity 64 kWh lithium-polymer battery pack. Buyers will also be to specify an optional 39.2 kWh lithium-polymer battery pack, with a range of up to 186 miles from a single charge. Power is provided to the front wheels through a 150 kW (200HP) motor, producing 395Nm torque from, and that's enough to ensure that this electric Niro won't be left standing at the lights with the 0 to 62mph sprint achieved in just 7.8 seconds. 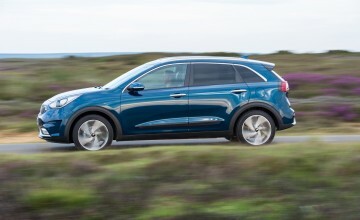 The battery pack is located low down in the body, beneath the boot floor, giving the crossover a centre of gravity more akin to that of a saloon or hatchback. 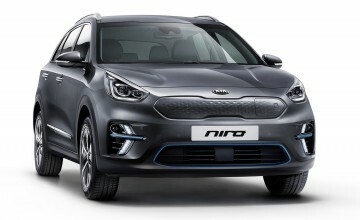 When it arrives here, it will join the existing Hybrid and Plug-in Hybrid versions of the Niro, but the Korean company's designers have come up with a few fresh styling features to ensure it stands out from its siblings. The new features are carried over from the Niro EV Concept which was unveiled in Las Vegas earlier this year. 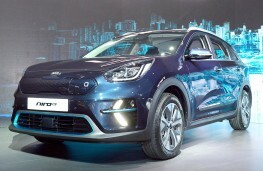 The trademark Kia ‘tiger-nose' grille in body colour houses an integrated charging port while redesigned air intakes and new arrowhead-shaped LED daytime running lights combine with light blue trim highlights to make it stand out further. More muscular wheel arches house new, five-spoke 17-inch alloys with a diamond-cut two-tone finish. 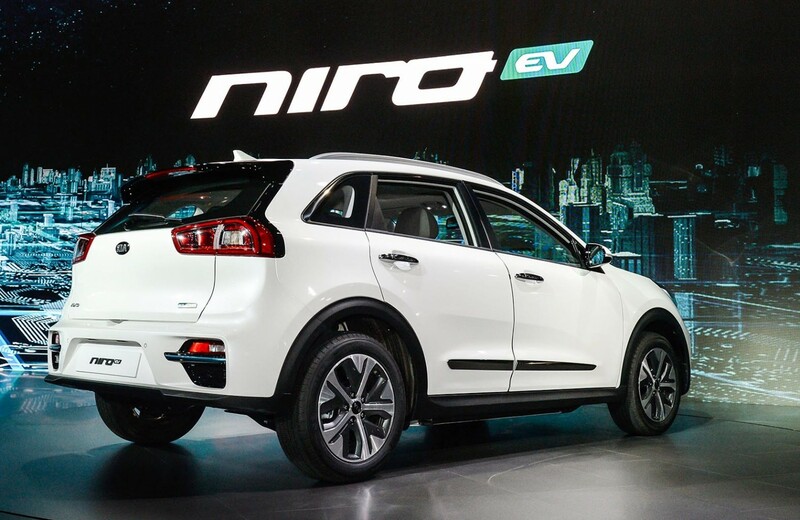 At the back, reshaped rear bumpers feature similar light blue highlights to those found at the front of the car, while new LED rear lights give the Niro EV its own light signature. The interior has also been reworked with a range of new features and design elements. 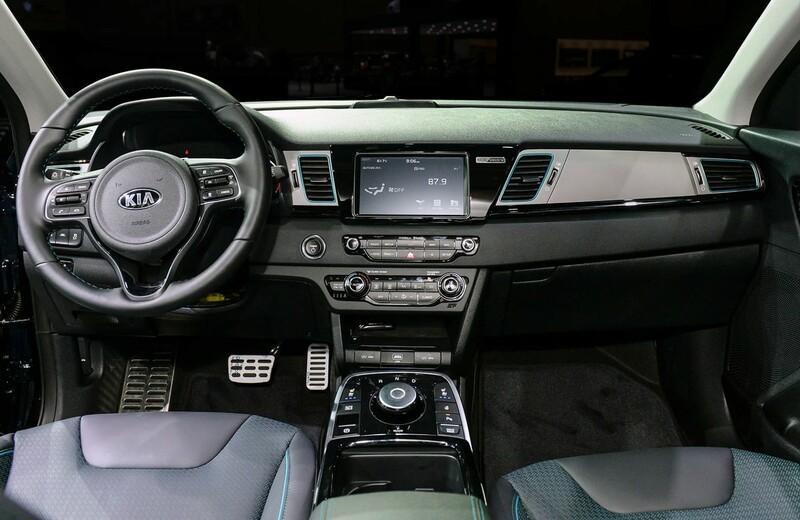 The dashboard features new light blue trim, echoing that of the exterior, while the design of the centre console has been simplified to accommodate the car's shift-by-wire drive selector - Kia's first ‘dial'-style shift knob. There's a new mood lighting system, with subtle lighting in a choice of six colours - white, grey, bronze, red, green, and blue - illuminating both the centre console and the drive selector. New high-gloss black or blue trim lines the doors. 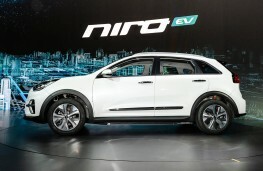 The Niro's seven-inch touchscreen has been updated to provide a series of EV-specific features. 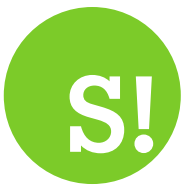 The new system enables owners to locate nearby charging points and monitor the level of charge and range remaining from the battery pack. The instrument cluster - a seven-inch colour-LCD display - is also unique to the Niro EV. As you might expect in such a high-tech machine, a range of advanced active safety systems will be available including forward collision warning with collision-avoidance assist, smart cruise control and lane following assist which controls acceleration, braking and steering depending on the convoy of vehicles in front, using external sensors to maintain a safe distance.